Flaky pouch of plain flour stuffed with potatoes,green peas and spices. Crispy mixed vegetable and onion fritters. Mushrooms marinated in a spicy yoghurt sauceand cooked in the clay oven. Tender chicken marinated in fresh herbs and spices and cooked in tandoor. 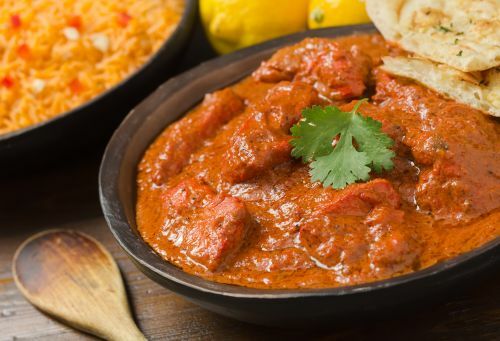 Tender boneless chicken marinated in sauce androasted in the tandoor. Tiger prawns marinated upon order and servedwith tamarind chutney. Strips of boneless chicken dipped in chana flour andfried in canola oil. Diced lamb marinated overnight and toasted in theflour and fried in canola oil. An assortment of vegetarian starters served with tamarindchutney. Assortment of tandoori chicken and lamb items. Contents of samosa, Onion Bhaji, Chicken Tikka, LambBoti Kabab, Chicken Pakora, Tandoori Chicken andTiger Prawns. Naan sprinkled with diced garlic. Naan sprinkled with diced onion. Naan bread stuffed with cheese and diced garlic. Naan bread stuffed with minced chicken or lamb. Unleavened whole wheat flaky bread stuffed with potatoes. Naan bread stuffed with almonds, raisins, coconut andmango pulp. Naan bread stuffed with homemade cheese and bakedin the tandoor. Whole wheat flour bread baked in the tandoor.